Huge congratulations are extended to Jason DeWitt who has emerged victorious in one of the toughest big-field events we've seen at the WSOP for quite some time. Just go back and take a look at our Day One coverage to gauge just how strong the field was for this event. 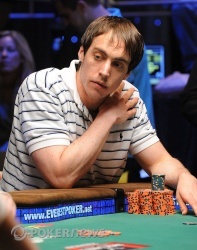 Not only that, but they played an extremely aggressive, fearless brand of poker for the entire three day stretch. It's a credit to young Jason DeWitt that he not only withstood everything that was thrown at him, but he thrived on it. He was the chip leader entering today's play and when it was all said and done, he was the last man standing. DeWitt certainly had some cards, and as he said to Sam Trickett following their contest, "You ran really bad...I had it every time!" However he also had a few things go against him, with a couple of lost races against short stacks during the evening, and was able to maintain his composure and recover. At times the final table was thrilling with excitement, but in the end it was the disciplined, composed approach of DeWitt that emerged triumphant with shiny new gold bracelet and $818,959 in prize money. Time for us to get out of here. 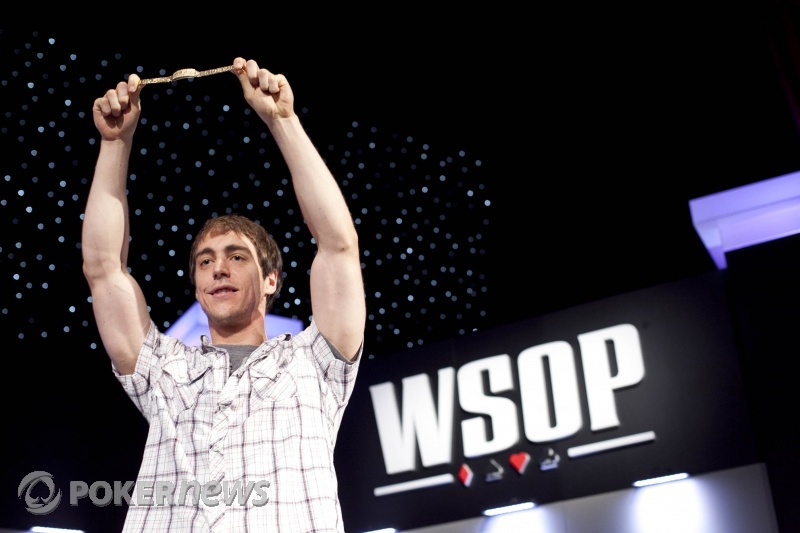 Thanks for your company and we look forward to you joining us again tomorrow as the 2010 World Series of Poker continues! Good night from the Rio! Sam Trickett Eliminated in 2nd Place ($505,725); Jason DeWitt Wins! Jason DeWitt moved all in from the button in his first real preflop attack on the stack of his opponent. 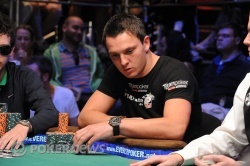 Sam Trickett looked down at his hole cards and made a quick call! DeWitt got caught but had live cards for a shot at the title. The flop fell and DeWitt spiked a pair to take the lead as Trickett flopped a straight draw for the sweat. The turn changed nothing and Trickett was left needing an ace, nine or four to stay alive. It wasn't to be as the landed on the river and Jason DeWitt is our champion! A bitterly disappointed Sam Trickett is consoled by his friends and family on the rail, but he'll wake up tomorrow morning with 505,725 reasons to smile. Sam Trickett limped from the button and Jason DeWitt checked his option in the big blind. The flop was and both players checked. The was the turn card and DeWitt fired out 200,000. Tricket folded and DeWitt is inching close to the title! Jason DeWitt limped the button before Sam Trickett popped it up to 460,000. DeWitt made the call and the flop brought . Trickett was first to act and he bet out 375,000. DeWitt made the call. The turn card was the and Trickett took his time to check it over to DeWitt who, rather surprisingly, made a quick bet of 500,000. Trickett made the call. The river was the and Trickett checked it over to DeWitt who asked for a count of his opponent's stack before moving all in. Could this be it? Trickett was put to a decision for his tournament life, and understandably he thought long and hard. The crowd that was still 30-40 people strong on the rail went into deep silence as Trickett stood from his chair and contemplated his decision. He eventually made a reluctant fold, as the calls of "good fold, good fold" came from his entourage on the rail. Jason DeWitt raised the button to 340,000 and Sam Trickett made the call. The flop was and both players checked. The turn brought the and Trickett led out for 375,000 and DeWitt made the call. The river landed the Trinkett made a deliberate check to DeWitt who again considered all of his options carefully before eventually reaching for chips with a bet of 600,000. Trickett lets it go and DeWitt extends his chip advantage. Following the break, Jason DeWitt raised it up to 355,000 from the button and Sam Trickett made the call in the big blind. They saw a flop of and both players checked. The turn was the and Trickett checked again to DeWitt who took the opportunity to fire 250,000. Trickett made the call. The river was the and Trickett checked again to DeWitt who checked behind. Both players showed an ace, for Trickett and for DeWitt, and they chop it up! The players are now taking another twenty-minute break. Power nap anyone?